Photo source: David Haberlah. Some rights reserved. The Dar Hamid are a confederation of about nineteen tribes and some smaller sub-groups that share a common culture and are led by a single nazir (chief). Although the tribes have different origins, most of their ancestors came from Arabia. Unfortunately, most Dar Hamid cannot read or write. The Dar Hamid dar (territory) is located in Northern Sudan. Like other nomadic Arab tribes, the Dar Hamid wander the desert with their herds, searching for vegetation that grows after the rare desert thunderstorms. They have a complex system of migration in which different parts of the family move to different places during certain times of the year. The Dar Hamid raise all types of livestock which are traded for grain and other essentials such as salt, tea, sugar, cloth, dates, seasoning, and metal goods. Camels are the most important of their animals. They provide milk, a main diet staple for the nomads, occasional meat, material for tents, and transportation across the desert. Because the Dar Hamid are a nomadic people, they live in dikkas (camps). Their homes are tents made with camel hair roofs and cotton sides. Many of the tents are decorated inside with leather and wool ornaments. The basic item of furniture is a double bed made of palm ribs bound with strips of leather. The bed rests on pegs a foot above the ground. The Dar Hamid lifestyle dictates that even the tent's decorative ornaments have a practical value. By tradition, Arabs are very hospitable and always provide for their guests. While the Dar Hamid men move across the desert with their camel herds, the women and children stay home in the dikka. The women tend the gardens and the small boys work in the fields, herding house camels and preventing goats and sheep from entering the cultivated land. Dar Hamid children are sent to herd animals almost as soon as they can walk. They have been described as shy and reserved, even with each other. Because life in the desert is very dangerous, all of the Dar Hamid men wear sheathed daggers on their left arms. Most carry swords and all carry either shotguns or rifles. They must sleep lightly at night to protect themselves and their tribes from bandits. Their main diet consists of tea mixed with camel's milk. If one of them has the good fortune of killing an animal in the desert, they will also have meat to eat. Each man carries a canvas sheet that has many purposes. The canvas can be used as a ground sheet, a tent, a trough for watering animals, or a sling for carrying heavy items such as loads of hay. Before the 1960s, the number of livestock a tribe owned was limited by the accessibility of water. At that time, the government drilled new wells, enabling the livestock to flourish and the herds to increase. Unfortunately, the pasture lands could no longer sustain the large number of animals. Diminishing rainfall has destroyed the pastures. Many of the herdsmen have lost their livestock and have been forced to move from their homes. Traditionally, the Dar Hamid are Sunni Muslims. However, most are not religious and know very little about the Islamic religion. One of the five "pillars" of Islam is that a Muslim must pray five times a day. However, among the Kababish, some pray only when they feel like it, while others never pray at all. Water is scarce, so the cleansing rituals are either cut short or ignored completely, and sand is used in place of water. Since very few of the Dar Hamid are able to read or write, many consider the written word a source of magical power. Fakirs (holy men) make charms and sell them to the tribesmen for cash or livestock. 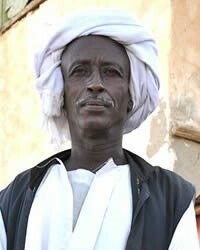 Clear identification of the various groups in Sudan is difficult since their cultures and lifestyles often overlap. However, most remain proud of their tribal and ethnic identities. Compassionate missionaries who are willing to embrace the Dar Hamid culture and endure the harsh, nomadic lifestyle are desperately needed. Since many of the tribesmen cannot read, Christian teachers are also needed. * Ask the Lord of the harvest to send forth laborers into Sudan. * Ask God to raise up prayer teams that will break up the soil through worship and intercession. * Pray that God will send forth Christian teachers to work among the Dar Hamid tribes. * Pray for the small number of Kababish Christians. * Ask the Holy Spirit to soften the hearts of the Dar Hamid towards Christians so that they will be receptive to the Gospel. 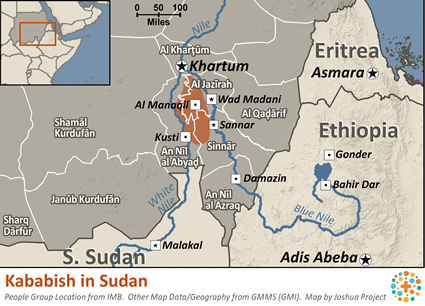 * Pray that God will open the hearts of Sudan's governmental leaders to the Gospel. * Ask the Lord to raise up strong local fellowships of believers among the Dar Hamid.View Kababish in all countries.